The Habu airframe has been a favorite among EDF beginners and experts alike. It’s simple design is rugged yet it’s performance always pleases. Horizon Hobby has released a number of aircraft in the Habu line and today we’re looking at the latest. 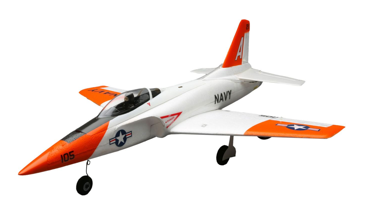 This new UMX design is the first Habu to incorporate the SAFE technology making this micro jet even better for pilots wanting to step into an EDF design. It’s simply charge the battery, and bind the UMX Habu S to your favorite DSM2,DSMx transmitter and your off flying in the jet age. Pitch and roll angle limits combine with electronic self-leveling to help you keep the UMX Habu S flying smoothly. 1. Pilot loses control of the aircraft in any flight mode. 3. …once the aircraft is flying straight and level, the pilot returns all other controls to their neutral position and continues a gentle climb to a safe altitude. The installed E-flite® 28mm Delta-V® 180m ducted fan and 11750Kv brushless inrunner motor combination efficiently converts incoming air to forward thrust. Careful sculpting of the internal duct allows the Delta-V® 180m fan system to deliver optimal performance. The included rechargeable ultra micro 200mAh 2S 7.4V 25C Li-Po battery is capable of delivering 3-5 minute flight times. The included Celectra™ 2-cell Li-Po AC/DC charger can recharge the provided high-output battery in about 20-minutes.